If I could go back in time and rejoin myself in a position just prior to having seen In the Mood for Love, I would do it in a heartbeat. Oh, to relive that first taste of love! To fall under the spell of Wong Kar-Wai's romantic tragedy as an innocent once more! Sure, In the Mood for Love gets deeper and more fulfilling the more often you watch it, but nothing will ever compare to that first blush of discovery, of experiencing its lush pleasures unaware. In the Mood for Love takes place in Hong Kong in 1962. It begins as two couples, the Chows and the Chans, rent rooms in neighboring apartments. Tellingly, only one spouse from each couple is there to look at the rooms; their absent halves will be absent for most of the movie, and when they do appear, it's either just off screen or with their faces just out of frame. 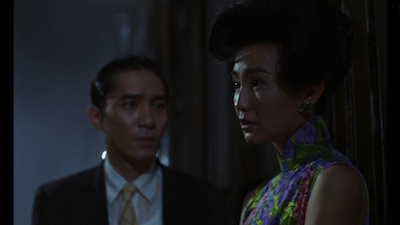 Mrs. Chan (played by Maggie Cheung Man-yuk, from Clean and Irma Vep ) is renting a room from the elderly Mrs. Suen (Rebecca Pan), while Mr. Chow (Infernal Affairs star Tony Leung Chiu-Wai) takes the space next door with the Koos. The floor of their building is its own community. The older landlords regularly share meals and play mahjong late into the night. For Mr. Chow and Mrs. Chan, however, this welcoming environment soon becomes a place of deep loneliness. Their partners are increasingly absent, both apparently called away to work overseas in Japan. The husband and wife that remain eat take-out noodles in their rooms, passing each other in the hallway going to and from the restaurant, on their way out and coming back home from work. They share pleasantries, and discuss a mutual affection for martial arts stories. The connection between them is tenuous at first, but as time passes, they begin to notice they are alone at the same times. Other telltale clues emerge, and before long, they realize that their missing spouses are having an affair. It's fitting that once the truth is revealed, we never see Mrs. Chow or Mr. Chan again. Their presence is felt, but for all intents and purposes, they are gone and not coming back. The pair they left behind becomes friends, bonding over their shared heartache, and eventually falling in love themselves. Except, the true heartbreak of In the Mood for Love is that these jilted romantics are both too good for their respective spouses and too committed to their marriage vows to follow through on their own feelings. They don't want to stoop to being cheaters themselves. Instead, they spend their time role playing, trying to imagine how Mr. Chan might have seduced Mrs. Chow, and vice versa. They rent a hotel room, but it's to lock themselves away, dreaming up martial arts serials together, imagining a more noble and passionate life than the one they share in the real world. 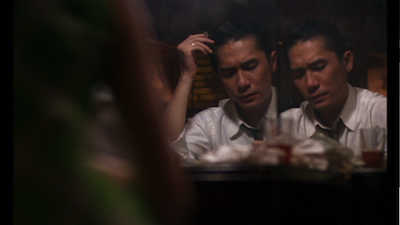 In the Mood for Love is the second part of a semi-official narrative trilogy that starts with Wong Kar-Wai's second feature Days of Being Wild and concludes with the more recent 2046 [review], which picks up with Mr. Chow years later, alone, a successful writer, broken-hearted. The film perhaps best exemplifies the writer/director's improvisational style, notable for having begun life as a comedy about food before morphing into the sad tale of love's failure. In the Mood for Love has its own unmistakable rhythm, something comparable to the duplication and growth in Alain Resnais' adultery drama Last Year at Marienbad [review], but more self-contained and grounded. You'll be amazed by how many times two people can walk up and down the same stairwell and how it can have a different meaning every time. Pain and disappointment compounds and self-replicates even as love blossoms, the repetition creating echoes that deepen the emotions rather than dull them. Additionally, Mark Galasso's music cues enhance the drama by signaling the different sentimental beats, working the audience to a point where our response to the familiar melodic strains becomes almost Pavlovian. The orchestration is like a glacier slowly blanketing the film in icy sorrow. The reason so many romantic comedies don't work is the same reason that an untraditional, experimental film like In the Mood for Love does. It's because most romantics, the true ones, are actually cynics. They want to believe in love, but experience has taught them to be distrustful; at the same time, they staunchly defend their romantic ideals. Sure, it would be lovely to see a version of In the Mood for Love where Mrs. Chan and Mr. Chow throw caution to the wind and succumb to their passions, but something would be lost as a result. Their love is purified by their pain. Ironically, they are more the married couple than the absent lovers. Their lives devolve into routine and familiarity. Perhaps the true secret of their maintaining their connection is that by denying their desires, those desires increase. As long as they are together, they have something more to look forward to. In a better world, Tony Leung and Maggie Cheung would be the biggest stars on the planet. What they do here is remarkable. 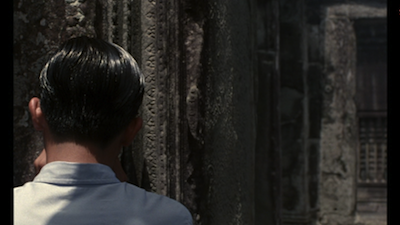 The emotional core of In the Mood for Love relies on what isn't said. The communication is all in gesture and expression. Even when the two are speaking, more often than not they are pretending to be someone else. Their games fall apart because they can't fake being what they are not, and there is more honesty in these acts of pretend than you'll find in most performances in mainstream love stories. 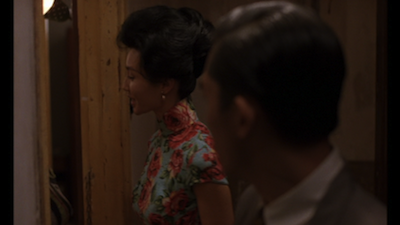 There is a scene 2/3 into In the Mood for Love when Mrs. Chan breaks down. The pressure of the gossip about her relationship with Chow and the inevitability that she will lose him is too much for her to bear. The actors go to two different places here: she is given to great heaving sobs, he must stand stalwart and resolute. Both portrayals are devastating. The true agony of a relationship ending is evident in how they hold themselves, how they look away from one another. The hurt vibrates through every fiber of their being. For all the resonance of In the Mood for Love's narrative, what makes it even more special is how beautiful it is to look at. This is the kind of film you could just as easily put on mute and let it run in the background. Directors of photography Mark Li Pin-Bin and Christopher Doyle (Hero ) and art director Man Lim-Chung work with Wong Kar-Wai to create a nearly surreal, painterly version of early-'60s Hong Kong. The urban landscapes appear inspired by Edward Hopper, with their solid colors and idyllic lighting, turning the cramped spaces into almost otherworldly, futuristic visions. (Indeed, in 2046, when the story leaps from the real past to an imagined science-fiction future, it's not much of a leap at all.) Part of our willingness to stick with the movie's reverberating storytelling pattern is our willingness to keep staring at all the lovely detail, be it the red-hot décor of the hotel getaway or the hypnotic patterns of Maggie Cheung's amazing wardrobe. In much the same way we revisit our favorite songs (indeed, even on the soundtrack itself, which uses Nat "King" Cole as part of Galasso's score), we also revisit our favorite images, like flipping through a book of photos and paintings. It's like I said at the outset, In the Mood for Love is a movie you will want to revisit again and again. Your understanding and appreciation of it will only increase, even as you yearn to be as innocent as you were when your path and it first intersected. Because if you could somehow get back there, if Mr. Chow and Mrs. Chan could always keep meeting for the first time, then they would never have to endure the anguish that will inevitably follow, and you might still believe that a better outcome is possible. For a complete rundown on the special features, read the full review at DVD Talk. Images here were taken from Criterion's DVD edition (ca. 2002) and were not taken from the Blu-Ray under review. It looks truly beautiful, story-wise and cinematography-wise. Great review.